James D. Bamford is a consultant in Washington, D.C., who focuses on a range of alliance issues including strategy, deal making, governance, launch, restructuring, and portfolio management. He was the cofounder and editor of The Alliance Analyst. Benjamin Gomes-Casseres is a professor at Brandeis University and previously was at Harvard Business School. He wrote The Alliance Revolution and numerous articles on alliance strategy and he consults and teaches widely on the topic. Michael S. Robinson is a consultant in Sydney, Australia, and was cofounder and publisher of The Alliance Analyst. He launched a number of publications and started successful businesses in Asia, Europe, and the United States. Introduction: What Is Alliance Strategy? 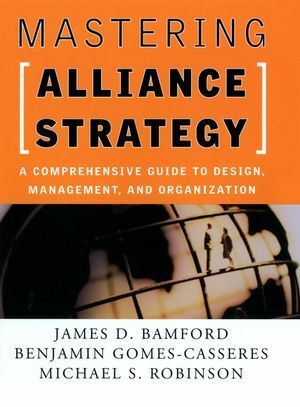 Part One: Designing Alliances Setting Strategy. 1. Envisioning Collaboration (David Ernst). 2. Finding Joint Value (Charles Roussel). 4. Entering Emerging Markets (Ashwin Adarkar, Asif Adil, David Ernst, Paresh Vaish). 5. Putting Strategy Before Structure. 7. Crafting the Agreement: Lawyers and Managers (David Ernst, Stephen I. Glover, James D. Bamford). Part Two: Managing Alliances Working Together. 9. Relationship Management (Jeff Weiss, Laura J. Visioni). 11. Making Joint Decisions (Francine G. Pillemer, Stephen G. Racioppo). 12. Managing Without Control (Gene Slowinski). 14. Roles of the Alliance Manager. 15. Life as an Alliance Manager. 16. Why Joint Ventures Die (Bruce Kogut). Part Three: Competing in Constellations Managing Networks. 21. Reaching Every Pocket: Coca-Cola. 22. Network Effects: Visa International. 23. From Local to Global: Colliers International. 24. Leading Wagon Trains: Western Wisdom. Part Four: Building an Alliance Capability. 25. Growth of Alliance Capabilities (James D. Bamford, David Ernst). 26. Alliances Across the Corporation: Unisys. 28. Grandmasters at the Extremes. 29. Order Out of Chaos: Lotus Development. 30. From Art to Science: FedEx. 31. An Army of Diplomats: Eli Lilly (Nelson M. Sims, Roger G. Harrison, Anton Gueth). Mastering Alliance Strategy Web Site Visit the Mastering Alliance Strategy web site to learn more about this comprehensive guide to building and managing alliances. If you're an instructor, look for the course outline and case study PDF.